What is the difference between a negative exponent and a positive exponent? 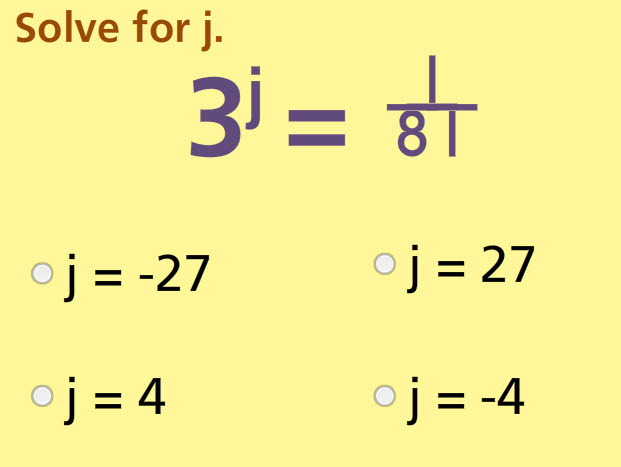 Knowing the difference and how to solve problems and expressions with negative exponents is very important in completing this online math activity. This test has ten multiple choice and drag-and-drop problems involving expressions that include some negative exponents. Students must use the rules of working with negative exponents to solve mathematical expressions. Return from this Negative Exponents Math Test to the Middle School Math Tests, 8th Grade Math Tests webpage, or to Math Tests.